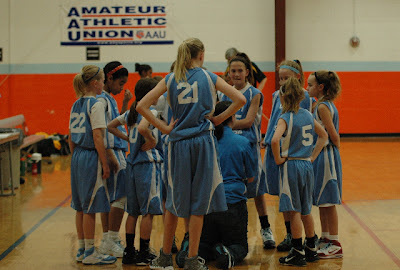 My daughter's 4th grade AAU team has been together since December '10. The team played up in a local winter league against 5th and 6th grade teams to prepare for the 4th grade AAU season. The girls took their lumps playing against bigger, more physical and more experienced teams, but they also won quite a few games while they gained confidence and toughness. 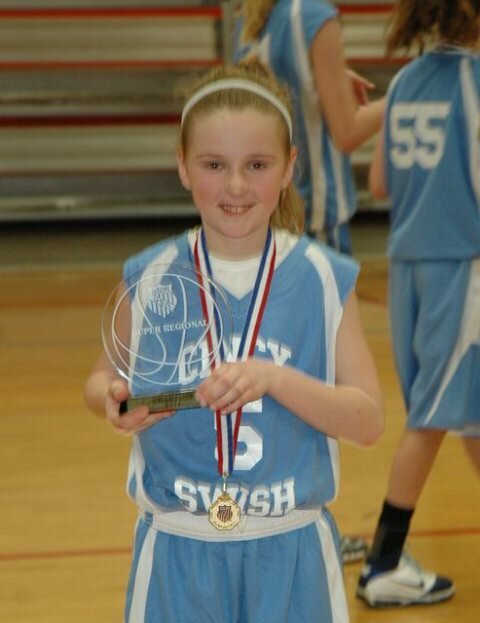 The team also played in several 4th grade tournaments over the winter to gauge where they stood against their peers. These games gave CC's team a chance to work on plays without the intense pressure that older girls provided. 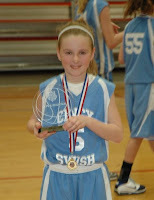 The team won every 4th grade tournament game leading up to their eventual run at AAU Division I National Championship. In fact, they won almost every game by a margin of victory of 10, 20 and 30+ points. They were ready to start the climb to a national championship. 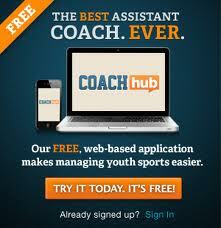 The AAU season started March 25th at the pre-qualifying tournament. The Ohio AAU put on a pre-quaifying tournament the weekend of March 25th. CC's team entered the tournament to prep for the Super Regionals the following week. Note: Super Regionals, Districts and the National Tournaments all use a 30 second shot clock. It's highly recommended that teams who have not played with a 30 second shot clock play in a pre-qualifier to get used to the shot clock. Our 4th grade girls had never played with a shot clock before. CC's team won all of the pool play games of the pre-qualifier including an exciting over-time victory against the host team. It was the first 4th grade team to challenge our girls. The host team then avenged their heart breaking loss in pool play to win the tournament championship game. That was the first loss of the season against a 4th grade team. I am pretty sure the team felt like the #1 UCONN women did tonight after losing to Notre Dame. After the loss, there were no tears, but the team did leave with a feeling like they could have and should have won the tournament. After the game, the team was reminded that they would get a chance to take it back the next weekend in the Super Regionals. And they were also reminded that they would have their 5 ft. 9 in center back who missed the pre-qualifying tournament due to spring break. The pressure was on. To gain a bid for a Division I National AAU Title, CC's team needed to win the tournament and that meant beating the team that beat CC's team in the pre-qualifier. The team's center was back in action and the girls won both pool play games, but it was not easy. The pool play game against our new rival went into over time again. CC's team was victorious, but the win was meaningless because both teams would advance to the Super Regional championship game. The finals turned out to be a very physical game between two teams that wanted desperately to earn a Division I bid. Girls were getting knocked down and crying, coaches were yelling and fans were riding the refs. It was pure excitement and I think that we all forgot that these were just 10 year old girls playing a game that was meant to be fun. The lead changed hands back and forth all game long until CC's team put together some clutch shots done the stretch to pull away and win 33-24. The climb to a Division I AAU National Championship is not easy. It will be a battle. I blog with unfounded confidence. I have no idea how good the teams are in other parts of the country in comparison to my daughter's team. It will be fun to watch it all unfold. Regardless of how it turns out this will be a great experience for my daughter.